One of the first interactions with David that we had was trying to rationalize a ship design engine that could be used to make ships in the game. We started with the mass and acceleration curves in the appendix at the back of On Basilisk Station, and then started working out (from the lengths, and Russ Isler’s drawings) volumes. As a general rule, if the outer shape remains the same, linear dimensions go up at the cube root of volume. In David’s books, we had superdreadnoughts running at around 65x the mass of destroyers…and were roughly 11x the linear dimensions, when they should have (assuming equal density) been about 4x the length/width/depth. (The cube root of 65 is a smidge over 4.) Clearly, something was amiss – to keep the listed dimensions and the listed mass, the superdreadnought needed to have its density drop by a factor of 20, which would make it not quite as dense as cigar smoke. So, with great trepidation, we approached David with the fact that we’d found an error. He said that, yeah, someone had pointed that out to him in book four or thereabouts, which was part of the reason why he’d stopped putting in quite so many specifications on ships, along with the fact that Honor was focusing more on being an admiral rather than direct ship handling. 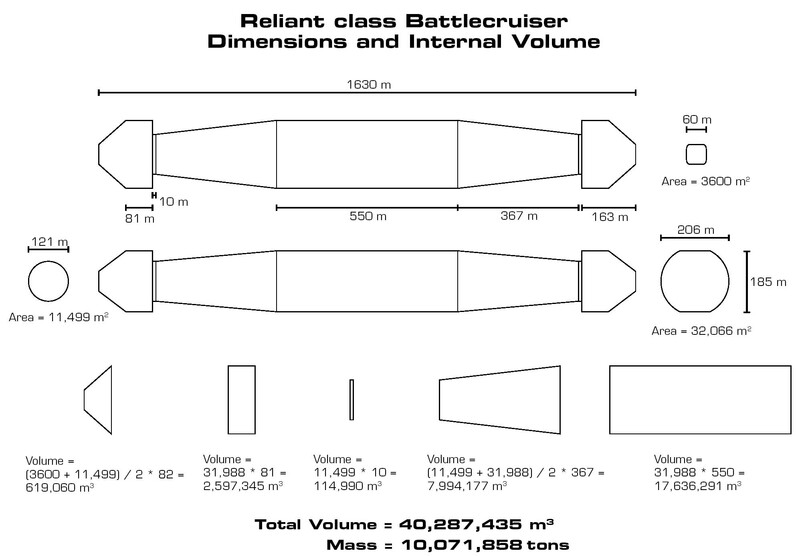 Taking the listed dimensions of a Reliant-class battlecruiser (HMS Nike), we built a spreadsheet to calculate the approximate volume That spreadsheet was later generalized to estimate the volume of an entire range of ship sizes using the basic Honorverse hull form, with parameters that could be set for different length-to-beam ratios, hammerhead sizes and even the shapes of the hammerheads. After presenting David with a range of options for hull density, he agrees that a density of 0.25 as an average for a fully loaded ship was about right for the setting. From there we were able to generate a new size chart that showed the two acceptable options; either keep the dimensions the same as the books and adjust mass or keep the mass the same and adjust dimensions. At the same time, we did a thorough search of all of the books to find all references to length or mass. While there were perhaps two dozen length references that would need to be changed over the entire series, there were over a dozen mass references per book. This, combined with the fact that David’s own shipbuilding system was mass based, led to the decision to . x mass as a constant and adjust lengths to match.